You Can Make These Rolls! Grind the poppy seeds. You may use a "poppy seed mill" or grinder, or grind it in several batches in a coffee grinder. Grind them for 1 to 2 minutes or until they are cracked and become darker and oily looking. Mix poppy seeds and the rest of the filling ingredients (through cinnamon) in a saucepan and bring to a simmer. Cook, stirring, for about 10 minutes, then remove from heat and cool. The dough is a simple, enriched, white, yeast dough. German recipes frequently call for a "Pfund" (one metric pound) of flour, which will make 12 to 18 regular rolls or 6 of these large rolls. *Instant yeast or bread machine yeast may be mixed directly with the flour and other dry ingredients. If you have regular, dry yeast, mix it with part of the lukewarm milk and let it sit for 10 minutes to rehydrate. Add with the milk to the dry ingredients and proceed as usual. If you wish to use fresh yeast, use a cake (20 to 30 grams) and dissolve in the milk prior to mixing with the flour. Mix the flour, instant yeast*, sugar and salt in a bowl. Melt butter and milk together, cool to lukewarm. Add the milk, butter, and egg to the flour and work (mix, then knead) it into a smooth dough. Knead for about 5 minutes, then form it into a ball, dust it with flour and let it rest for 30 minutes. It rises quite a bit and needs no further kneading or rise after this step. We used a bench knife to make decisive cuts. First, we cut the dough in half, smooth each half a little, then cut in half again and each quarter into thirds. This gives me 12 pieces of dough all about 70 to 80 grams (about 2 1/2 ounces) each. Roll out each piece to about 2 by 6 inches (5 by 15 centimeters) on a lightly floured workbench with a rolling pin. Add only enough flour to keep the dough from sticking. 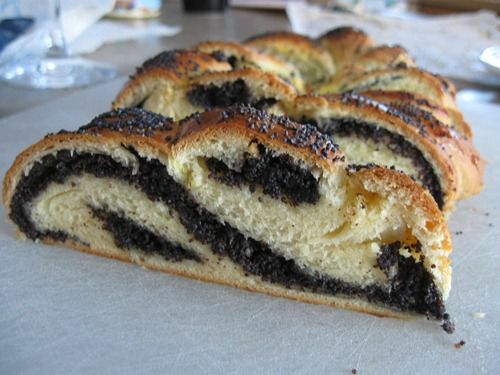 Place about 2 tablespoons of poppy seed filling down the center of each, lengthwise. Fold the dough lengthwise around the filling and pinch closed to form a rope. Make sure the ends are pinched closed as well. Roll the rope a little longer by rocking it gently back and forth with your hands. You will also smooth the seams you pinched closed, although they will not go away completely. This does not affect the final product. Twist two filled ropes together, then form into a ring, your final shape. You could also make braids or coils and bake them separately or together in a round cake pan to make a coffee cake. "Kreativität ist hier angesagt!" Repeat to make six rolls. Place them on a baking sheet. Bend the twisted bread dough back on itself to form a circle. Pinch one end of one rope together with the end of the second rope. Pinch the remaining ends together and tuck under the roll as best you can. Some rolls will behave better than others. Mix an egg yolk with a tablespoon of water. Brush the rolls with the egg yolk and sprinkle with a few poppy seeds, if you like. You may also sprinkle them with coarse sugar ("Hagelzucker" or "Perlzuker"). All these things make for a pretty presentation. These rolls can be baked as soon as you are done forming and decorating them. That is why it is a good idea to preheat the oven. If you have not done so yet, by all means, turn on your oven to 450 F now and let it heat up for a few minutes. Bake these pretties for 25 to 30 minutes, but turn down the oven to 350 F after 10 minutes, so that the crusts do not over brown. Turn the pan halfway through if browning unevenly. It is popular in Germany and Austria to turn these "wreaths" into "nests" by lightly pushing a hard-boiled, colored Easter egg into the center of each roll while still hot.